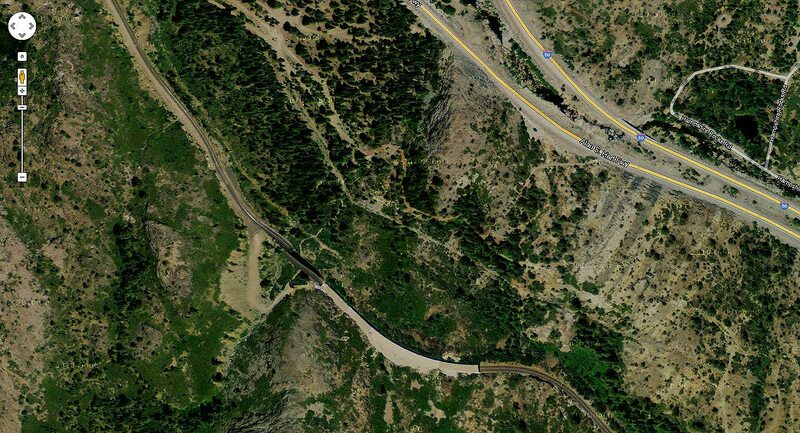 Above, you can see the relationship of Shed 10 (concrete edifice on bottom) to Interstate 80 at the top. Click on image to enlarge. Linking the concrete snow shed on the left (west) is the trestle illustrated in photographs below. Shed 10 connects one of two points on Union Pacific's east/west Roseville Subdivision where rail traffic is constricted, from a double track to a single track. Trains clog up going eastbound at the mouth of Switch 9 and Tunnel 41; trains clog up going westbound just prior to Shed 47 and prior to Shed 10 (historical article about the snowsheds here). Shed 10 rests on the eastern end of one of these single tracks, with Switch 9 on the western end of the single track, over Donner Pass. 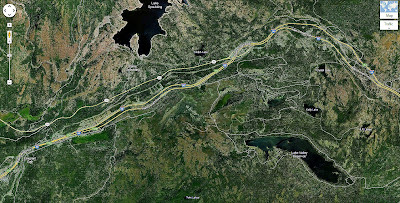 This 7.1 mile section is a bottleneck that constricts traffic -- particularly now that UP can run double-stack traffic over Donner -- as illustrated here since 2009. 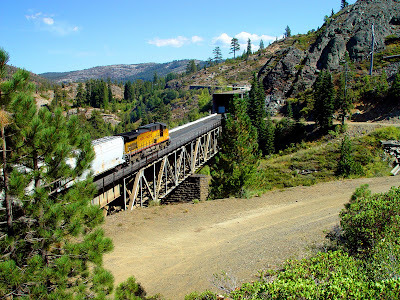 Track 1 and Track 2 over Donner Pass used to be continuously double-tracked, until Philip Anschutz purchased Southern Pacific in 1988 and ripped up portions of track in 1993 in order to distribute that rail to other lines (the Sunset Route, for one) without having to purchase new rail. That is when those two single-tracked choke points were created -- by the prior owner's short-sightedness and false thrift. 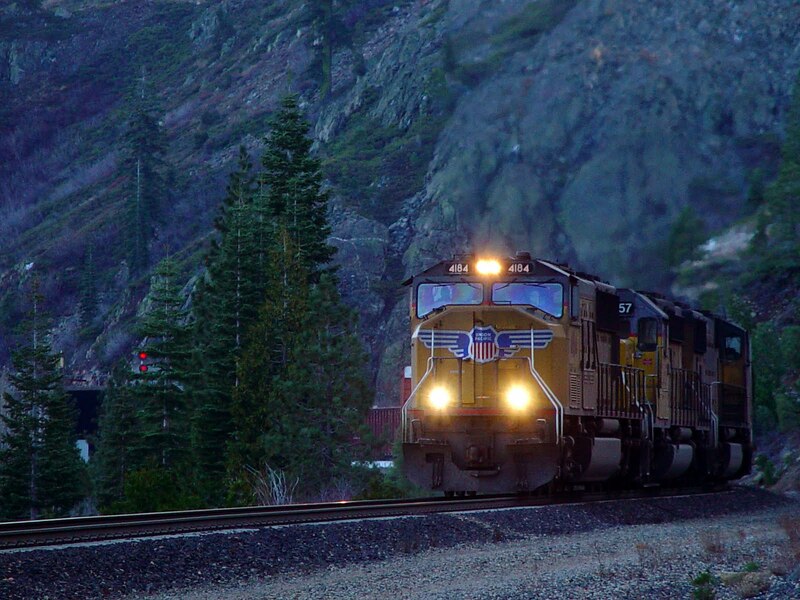 The current owner, Union Pacific, is considering double trackage again, along the entire route. 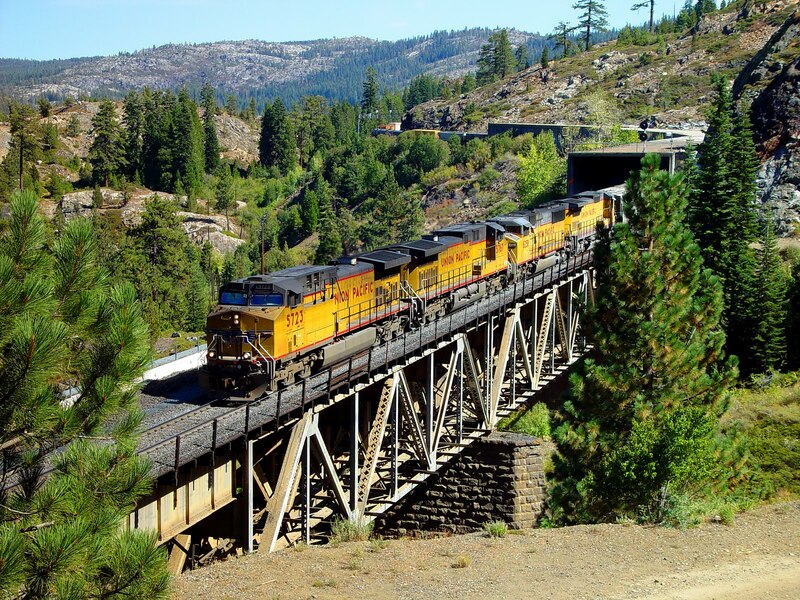 Union Pacific may, in fact, be quite serious about laying back down a second track again, as it spent millions of dollars to open up its tunnels along Donner Pass so that double-stack container cars could be accommodated in November of 2010. View of I-80 which is located just north of Shed 10. This shot is looking east towards the higher elevations. UP 4184, an SD70M built in 2001, 4,000 hp, rolls westbound (downhill) on the single track that begins behind the locomotive in Shed 10. You can see the vertical red signals through the trees, just over Shed 10's western portal. UP 5723 exits the western portal of Shed 10 over the trestle built in 1904 by Southern Pacific. This is a GE C44ACCTE. You can also see, on this shot, where there is clearance for a second track and, as such, where the second track obviously used to be. The very last of its kind over Donner, CNW (Chicago NorthWestern) unit # 9776 (a GE C44-9W) exits the western end of Shed 10 as its train rolls downhill under maximum track speed of 25 mph. In a broader view, the DPU for UP 7614 (another GE C44ACCTE) rolls over the western trestle of Shed 10 in dynamic braking. Here, you can see the access maintenance road for Shed 10 itself. The trestle's construction date is clearly marked underneath on one of its diagonal metal braces, round rivets plainly evident. In 2011, this span is 107 years old and still holding its own despite over a century of Sierra Nevada winters and the abuse of heavier and heavier trains. The western end of Shed 10, ballast over the trestle, and CWR (continuous welded rail) held over the single track by newer clips and not spikes, with heavy metal ties underneath. Again, you can see there is clearance for another track on the left, should UP decide to add an additional line. BNSF 4654, another C44-9W, rockets up Donner in resplendent new War Pumpkin paint on approach to Shed 10, with gorgeous silver trucks and fuel tanks. 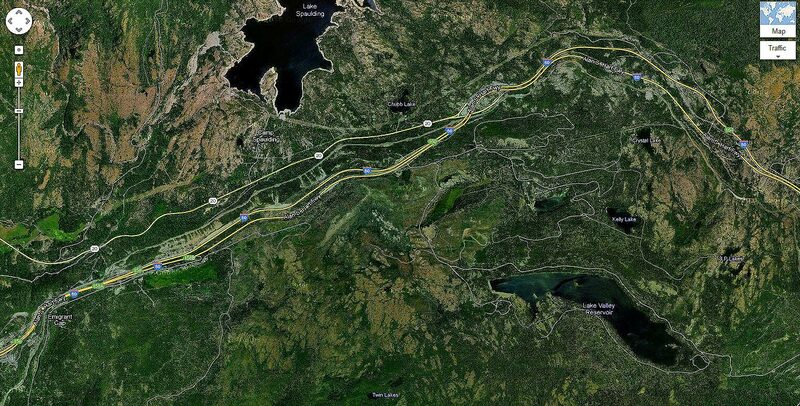 BNSF still has trackage rights over Donner when necessary, in order to satisfy various past FRA merger deals. A view of the western trestle approach to Shed 10. In the spring, this draw is awash with the cascading snow-melt of the previous season. Here, you can see the distance between Shed 10 to the east, and Switch 9 to the west. Interstate 80 parallels the rail lines because the hard work was already accomplished. The route of I-80 did nothing more than easily mimic the shatteringly-difficult work of the original Transcontinental Route over the Sierra Nevada mountains. Shed 10 is one of the few active snowsheds still left over Donner, built with concrete and protecting a valuable transition point on the line. 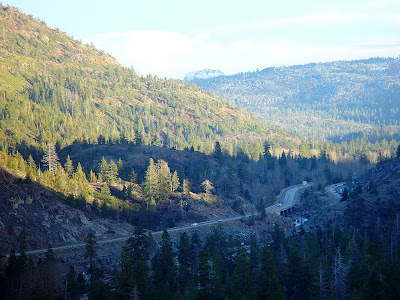 With the final removal of the original massive wooden timbers shrouding the western portal to The Big Hole (Tunnel 41), Shed 10 stands as a stark reminder that winter snows once easily occluded the rails over Donner Pass, and where Norden, in winter, was essentially a small town, buried under 40+ feet of snow. Shed 10 still stands today in contrast to the bulk and the rest of its uncovered and unfettered trackage.